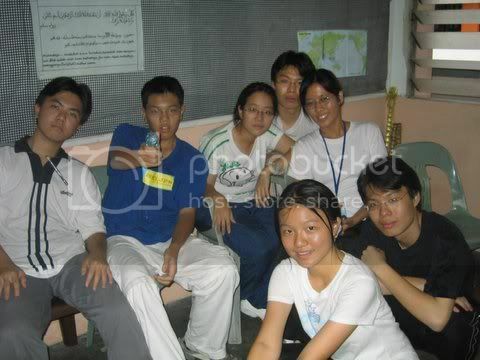 One day in 2005, four guys (Wei Wen, Ean, Aik Oui and Aik Sern) decided to participate in a singing competition. This was the first time the four of them joined forces to sing together. For some, it was their first singing competition ever. They sang Dui Mian De Nu Hai Kan Guo Lai that day. And without much practice, they got second place! Man! The competition must have really sucked BIG TIME!! With three girls (Winnie, Sharon and Sumin) joining them, they then subsequently decided to perform the song again. This time for their "beloved" Red Crescent Society's installation day. which literally translates to: 'guys with nothing better to do'. The story began wayyy back in 2003. To some that may not a be a very long time, but due to our relatively "short" lives, it was. Anyway, some of us may have already known each other long before 2003, but it was only in 2003 that all 7 of us were fully aware of each other's existence. We all met at our aforementioned Red Crescent Society. At that point of time, some of us were recruits, some were members, and the some were the "high and mighty" section leaders. But even though the was a variation in our rankings, being the very.. VERY few members of the same year, we just sort of stuck together. That was the beginning of a long, and I would say.. lasting friendship. Recess was spent hanging out together. weekends were spent chatting in the First Aid room. Life was good. After graduating from secondary school, time spent as a group plummeted significantly. The twins went off to Australia for studies. And the rest of us went to separate colleges. Despite the circumstances, we kept in touch and were ever so looking forward to the biannual gathering at the twins place. Ahh, the company. Now, all of us has completed college. Many of us moved overseas for further studies. The twins remained in Melbourne. Winnie left for Canberra, and Wei Wen left for New Zealand. The rest still have their foot firmly grounded on Malaysian soil. We are all forced to patiently wait for year end to come, when the now customary pool parties start again. This site serves as a memory to our friendship and also to help keep each other updated with the on-goings of our lives. With luck, this bond will last for many years to come. Annoying when first met, but really a nice guy. He has a twin, and claims to be the better half of the two, and vice versa. Womanizer since a young age and a bloody rich kid with a pool in his home, which all of us are thankful of because his house happens to be the venue of most of our gatherings. Also, he has a m****r f*****g foul mouth, so people, you d**n well better beware! The literal dancing queen only seventeen + 2 years. Definitely the cause of earthquakes in the Asia pacific region as she pumps it on stage. Also the musical organ of our gang and prone to random fits of bursting into song. Nevertheless under this layer of explosive musical violence lies a sweet, caring and... yes Ive said it ..... MOTHERLY nature. Referred to as the big che che of the juniors. Someone whose actually soft hearted enough to sing them lullabies if they have trouble sleeping. "Don't worry my darling juniors, Big che che will take care of you". But most of all shes a great friend to all of us in times of happiness and distress. We love you Winnie. Perilous, hazardous, and dangerous... the three words are but a few to describe Sharon Lam, one female every living entity should not mess with. she is able to slice you to shreds with her sharp and deadly tongue, her lightning fast words are so quick and precise you will not see it coming. She manipulates her way through various obstacles and keeps herself from harms way with her witty sarcasms. However, an able listener should she happen to rest her mouth, a probable advisor, but definitely a great friend. Someone that when you thought of Yoyo dance, he would appear in your mind…although already 19, we, the bunch of friends would sometimes shout to him “Grow up, kid! !”..Wei wen, is a very creative and cheerful guy. With his same types of brothers running around his house, you can imagine how chaotic his house is. But of course, he is good in entertaining us…Sometimes going to shop in shopping complex, one of us would say out loud, “hey, wei wen, stop it! !” Well, that is because he has a pair of very itchy hands..He likes to explore around, to feel and touch things that he sees. It is good indeed, but can be VERY annoying at times, especially when you are in the wrong mood. Nevertheless, he is an EXTREMELY good treasurer..He try to ensure that money will only go into the account, but no output..Being our treasurer for a year, every time when we ask for money, he will make sure he ask every single detail where the money will be used and whether it is worth spending. Last, and for the most important of course, a very very very loyal and beloved friend of ours. Party without always don’t feel complete. Because without his presence, we wouldn’t get to laugh as much.